Letter stationery in Japan is cute and ubiquitous. 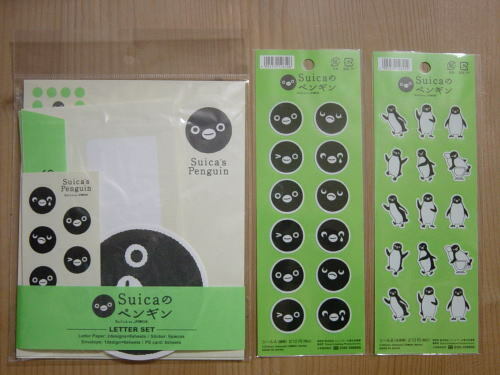 It's often sold in packs with matching envelopes and stickers called レターセット, "letter sets". I like to keep in touch with friends and family by post, so I frequently pick up a handful these stationery packs when I'm passing through the local 100-yen shop. 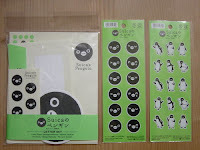 Stationery stores (of course), bookstores, and variety goods stores (chains like LOFT, Bulldog, Village Vanguard, or Tokkyu Hands) carry wide selections as well, and the quality here will be better, with thicker paper, prettier designs, and more durable stickers. Packs at these stores run from about 300 to 500 yen. Usually the packs, whether from a 100-yen or a specialty shop, contain five envelopes and ten sheets of stationery. Note also that manufacturers of the 100-yen varieties sometimes cut production costs by making the sheets and envelopes slightly smaller than standard sizes. This can be frustrating on the envelopes, which even at standard size are not designed with international mailing addresses in mind. If you like to use decorative stamps (記念切手, kinen kitte) or custom stamps on your envelopes, or if you need to use more than one stamp to cover postage, you might have trouble fitting the stamps within the space provided on the matching envelopes. Often the envelope flap is designed to close on the same side as the one where space is provided to write both mailing and return addresses, further cramping matters. In this case, it's of course easy to slip the matching envelope within a larger, plain white envelope--but there are other, cuter options, too. In next week's post, we'll talk a bit about "correct" stamp placement and take a look at some fun images. Follow us on Facebook or Twitter for the update!